This article is for you if you need to install a Word add-in from DocTools on a single or a few computers. The Word add-ins provided by DocTools via this site must be placed in the folder that is defined as the Word STARTUP folder. All Word templates, i.e. files of the types .dot, .dotx and .dotm, that are placed in the STARTUP folder are automatically loaded when Word starts and will work as add-ins. The functionality and tools included in the installed add-ins will be available to you as you work in Word. If an add-in is going to be used by many users in an organization, it is practical to use a login script to distribute the add-in to all users. For information about how this could be done, see e.g. Distributing macros to other users (opens in a new tab or window). Download the zip folder that was provided as part of the delivery of your add-in(s). Save the zip folder on your computer in a place where you can easily find it, e.g. on the Desktop. Unzip the zip folder. In the following, that folder is referred to as the unzipped folder. Follow METHOD 1 or METHOD 2 below as appropriate. IMPORTANT if you are using Word 2007: METHOD 1 does not work with Word 2007. If you are using Word 2007, follow the instructions below METHOD 2 instead. If a document named DocTools InstallationManager.dotm is included with your delivery of the add-in, you can use that document to handle the installation. Open the document DocTools InstallationManager.dotm found in the unzipped folder you just made ready in STEP A. The relevant files(s) are now automatically copied from the unzipped folder to the Word STARTUP folder. If a file in the STARTUP folder has the same name as a file copied from the unzipped folder, the file in the STARTUP folder will be replaced with the copied file. In that case, this procedure automatically works as an update. Go to STEP C below. Note that DocTools InstallationManager.dotm can also be used to uninstall the add-in. If a document named DocTools InstallationManager.dotm is not included with your add-in or if you are using Word 2007, you must handle the installation manually. However, don’t worry – that is quite easy. All you have to do is to copy the DocTools Add-in file to the Word STARTUP folder. Follow the steps below. The term DocTools Add-in is used below. In practice, the add-in you are going to install will have a specific name and the file extension will be .dot or .dotm. Exit Word if the program is running. Open a Windows Explorer window and browse to the unzipped folder you just made in STEP A. Select the DocTools Add-in file and press Ctrl+C to copy the file. In the Windows Explorer window, browse to the Word STARTUP folder. Press Ctrl+V to insert the file you copied. IMPORTANT: If the STARTUP folder already contains a version of the DocTools Add-in, make sure to replace it with the copied version. Even if you rename the old version, the macros in the two versions may conflict so that the functionality of the add-in does not work as designed. See How to find the Microsoft Word Startup folder (opens in a new tab or window). See How to make hidden files and folders visible (opens in a new tab or window). The installation is almost finished. Start Word. The DocTools Add-In should now automatically be loaded by Word. 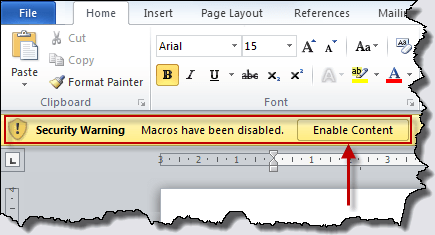 If a macro warning appears, either below the ribbon or in a separate dialog box, make sure to enable macros. For details about security warnings, see If a security warning is shown when you start Word after installing an add-in below. If a dialog box appears, asking to you enter a license key, enter the license key provided as part of the delivery of the add-in. The installation should now be finished and the functionality and tools included in the installed add-in will be available. All DocTools Add-ins contain macros. When you open a document with macros, a security warning may appear. A macro is a collection of commands that can be executed with a single click. 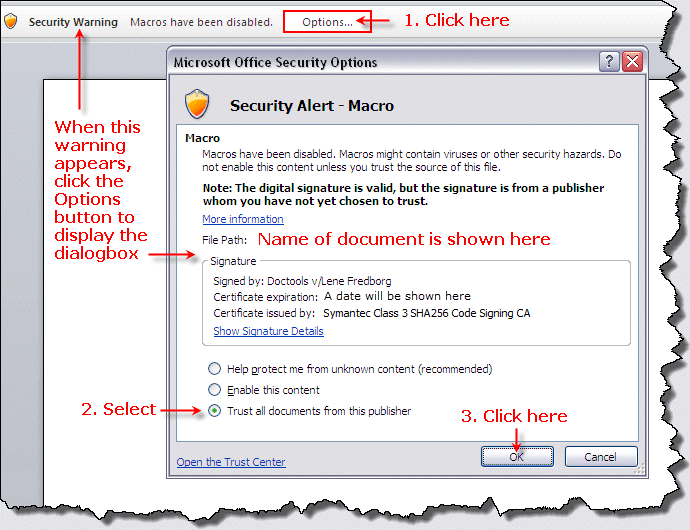 In order to take advantage of macros, your security setting in Word must allow it and macros must be enabled. Documents from DocTools that contain macros are signed so that you can use the macros even if your security is set to the highest level. In order for this to work, please follow the instructions below. Different types of security warnings may appear when Word opens a document that contains macros. The type and design depend on your Microsoft Word version, your security settings, etc. Figure 1. Warning about disabled macros. The first time you open a document from DocTools that contains macros you may see another type of security warning than the warning illustrated above. The design depends on your version of Microsoft Word. See the instructions in the illustrations below. 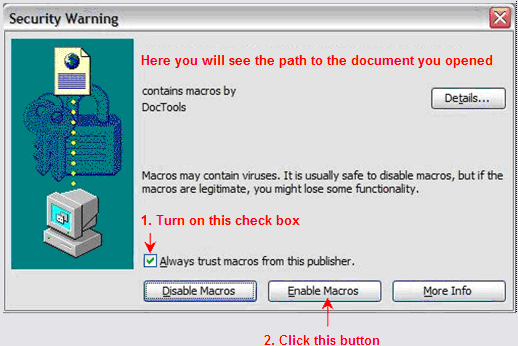 If a security warning like the ones shown below appears and if you follow the instructions in the illustrations, macros will automatically be enabled when you open documents with macros signed by DocTools. Figure 2. Security settings – example from Word 2007. Figure 3. Security settings – example from Word 2003.